A proven track record for responsive trusted patient care. We’ve been busy at Cascade Hernia & Surgical Solutions—and delivering highly personalized and quality care to our patients is only part of what we’ve been up to. With an updated name, refreshed look, and singular web presence, we’ve made it easier for current and future patients to learn how our surgical care can serve their health care needs. What hasn’t changed? We’re the same caring staff, under the leadership of Dr. Robert C. Wright, providing excellent patient care for many of your general surgery needs. 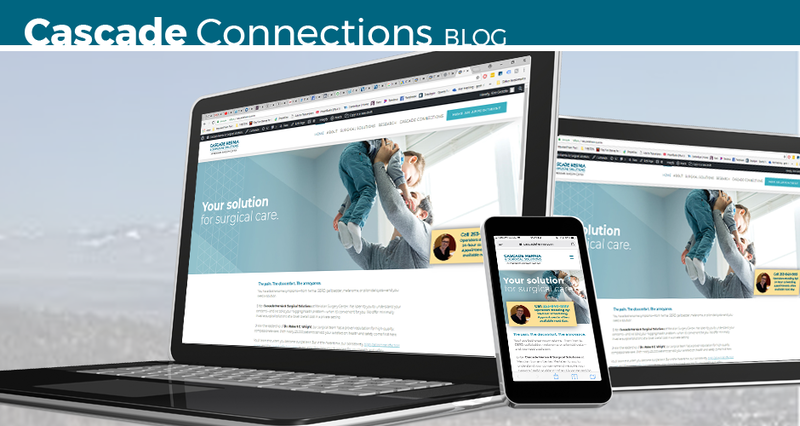 To introduce the new Cascade Hernia & Surgical Solutions identity, we’ve consolidated several websites—Meridian Surgery Center, Cascade Hernia Institute and Dr. Robert C. Wright—into one. And our new name and unified brand emphasizes the practice’s leadership and proven track record for responsive, trusted patient care. Visit cascadehernia.com to learn more about how you can get surgical solutions to bothersome symptoms from Gastrointestinal Reflux Disease (GERD), gallbladder, melanoma, pilonidal cysts and other conditions. You can also read about Dr. Wright’s latest independent research into innovative improvements to patient care, or catch up on our latest news, such as what our student researchers are up to on our blog. Want to learn more about who will take care of you at Cascade Hernia & Surgical Solutions and how our patients are satisfied? Read up on our highly qualified team, high patient satisfaction rates and low complication and infection rates—all at less cost than area hospitals. Cascade Hernia & Surgical Solutions at Meridian Surgery Center is an ambulatory (outpatient) care setting. We are Medicare certified and meet all Washington State and federal requirements for ambulatory surgical care. Dr. Robert C. Wright opened Cascade Hernia & Surgical Solutions at Meridian Surgery Center in 2001 and expanded at the new location in 2011. We accept most major insurance plans and offer convenient solutions for cash customers. Stay connected with Cascade Hernia & Surgical Solutions: Follow us on Facebook. Have a nagging health concern? Make an appointment for a consultation today. Call (253) 840-1999. Often, you can get an appointment on the next week day. Learn more about Cascade Hernia Institute at cascadehernia.com. I’m very pleased that Dr. Wright did surgery on me recently. He did an excellent job on my entrapped hernia near my belly button. Also introduced me to my “TENS” and my pain was greatly reduced without the drugs used for pain. Thank you Dr. Wright for making my life so much better. I would highly recommend Dr. Wright. I’m very pleased to have been under the care of Dr. Wright for my entrapped hernia. Very successful and he introduced me to my “TEMS” which was a great relief from any pain, without the pain pills. Thank you Dr. Wright and to your great STAFF. I would highly recommend Dr. Wright. Dr. Wright you removed my gall bladder March 24, 2015.